GF-5 and dexos: You get what you pay for – BG Products, Inc. I ‘ve received several inquiries about the new oil specs GF-5 and GM’s dexos and what it’s going to cost aftermarket suppliers, shops, dealers and, most importantly, consumers. I thought I’d use the BG Blend’r to clarify a few things. This one’s pretty self-explanatory; it’s a step up from the current GF-4, which has the corresponding API designation SM. But in case you didn’t know where it originated, the International Lubricants Standardization and Approval Committee (ILSAC) an association of automakers works with API and additive suppliers to determine the need for improved motor oil specs. Then, ILSAC sets the testing standards. Since 2004, when GF-4 was introduced, government regulations for fuel economy and lower emissions have increased, thus creating the need for a new spec: GF-5. GF-5 will be released in October (just as 2011 models hit the market). What are the improvements over GF-4? GF-5 has greater performance characteristics in emission system durability, seal compatibility, fuel economy, E85 rust protection, E85 emulsion retention, engine sludge protection, piston cleanliness and turbocharger protection. Many web editorialists have painted GM as the big bad OEM in this story, saying dexos is a violation of the Magnuson-Moss Warranty Act, which disallows tie-in sales provisions. A tie-in sales provision means “requiring a purchaser of the warranted product to buy an item or service from a particular company to use with the warranted product in order to be eligible to receive a remedy under the warranty.” According to my research, GM is not in violation of the Magnuson-Moss Act. The owner’s manual of the 2011 Buick Lucerne specifies dexos and warns failure without it, but it doesn’t require (by warranty) that dexos be used as a service fill. Now that we’ve established the legality of the GM specification, let’s move on to the necessity. Why did GM feel the need to create a manufacturer specification? Will other OEMs follow suit? Only time will tell if other OEMs will develop their own specifications. But we do know it could be a logistical nightmare for oil change and fast lube operators. Is dexos similar to GF-5? Although GM is launching dexos adjacent to the new ILSAC GF-5 spec and GM chairs the ILSAC oil committee, the two are not identical. GM dexos standards are far more stringent than GF-5. So, in theory, dexos meets and exceeds GF-5 standards but GF-5 does not meet the dexos specification. It is. Due to the divergence between GF-5 and dexos, manufacturers will likely have to pay licensing and royalty fees to make and market two or more distinct products that meet GF-5 and/or dexos requirements. The cost of GF-5 spec oil to suppliers will increase 15-20 percent due to licensing and development costs. Industry experts also predict a 25-30 percent rise in cost to suppliers in order to meet the dexos standard. It’s likely these increases will trickle down to consumers. However, with extended replacement intervals, dexos and GF-5 may be cheaper to consumers in the long run. BG maintains a stringent standard of quality across our entire product line. We are currently evaluating all eligible passenger car engine oils against both GF-5 and dexos standards. Right now, we foresee using a package that will allow us to meet both specifications without having separate oils for each spec. To keep costs down for the end user, we do not plan to pay for official licensing with the dexos spec or with API. Let’s face it. Engines and oils are getting better and better. But, as the standards are changing, it’s important to educate consumers on the benefits of a premium (most likely higher priced) oil. 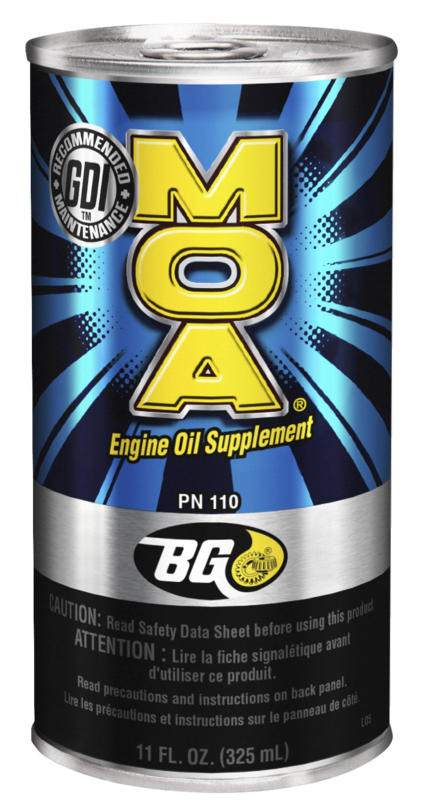 In using higher quality oil, consumers can expect fuel economy and emissions improvement, increased oil change intervals and lower overall maintenance costs (and with BG you get free lifetime protection when you use BG MOA® with each oil change). We’ve been proclaiming the benefits of BG’s premium products and services for years, and we know, when it comes to standards in the automotive industry, you get what you pay for.